These are dry, spring-actuated brakes that are compact and dedicated for braking. 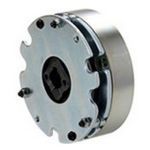 They use a friction material with high wear resistance, stand up to long hours of use, have small torque fluctuations, and brake loads instantly even under abnormal circumstances. The effect of the rotor spring located on the outer periphery of the rotor reduces unpleasant high-frequency friction noise that occurs during braking. Braking is quiet.